I can think of two cases off the top of my head where the parent or parents and child or children are all artists. I'm thinking of the Woodmans and the Smiths. Francesca Woodman, the brilliant photographer daughter of two artist parents, committed suicide when she was 22. (Their story was told in the powerful, disturbing documentary, The Woodmans.) Kiki Smith and dad Tony Smith could have had a joint exhibit before he died in 1980, but it would have been quite an odd mixture of work. The thing that stands out about the joint exhibit of Wendy Hook (mother) and Steven Hook (son) at Darke Gallery is how well their work compliments one another's. Wendy is a quilter. The only thing I can find out about her on line is that she won a prize in the category of "art quilt" from the Trinity Valley Quilters Guild. The notion that there is a separate category of quilts known as "art quilts" is highly intriguing, especially if we already accept that quilting is an artform. It suggests that within the quilting world (a world about which I am completely ignorant), there are quilters who distinguish their own work from the mainstream of quilting. Such a distinction exist within the world of comics, and the phrase "art comics" is a fairly sharp but contentious distinction within the world of comics. Perhaps it's the same for quilters. The thing I noticed first was how perfectly chosen Wendy's colors were. 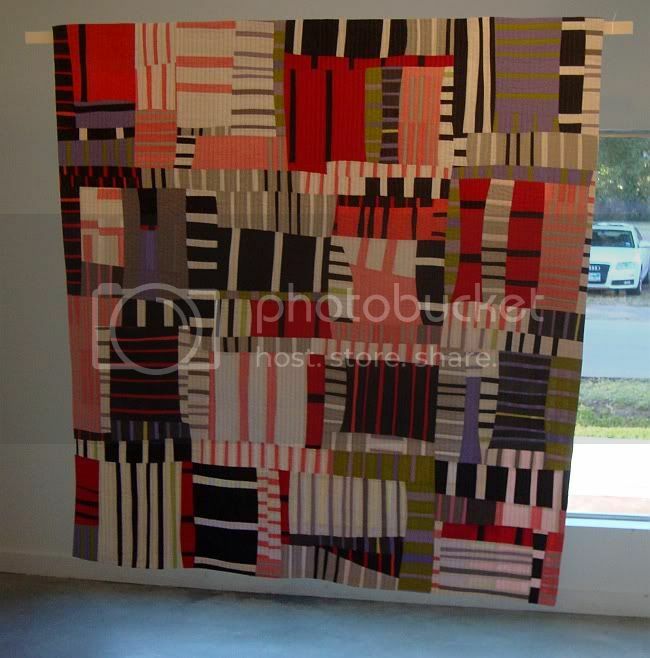 For example, in the highly rhythmic quilt, Intersections, reds and pinks dominate with a smaller amount of contrasting greens, an even smaller amount of blue-purple, all framed with blacks and whites that accentuate the rhythms. 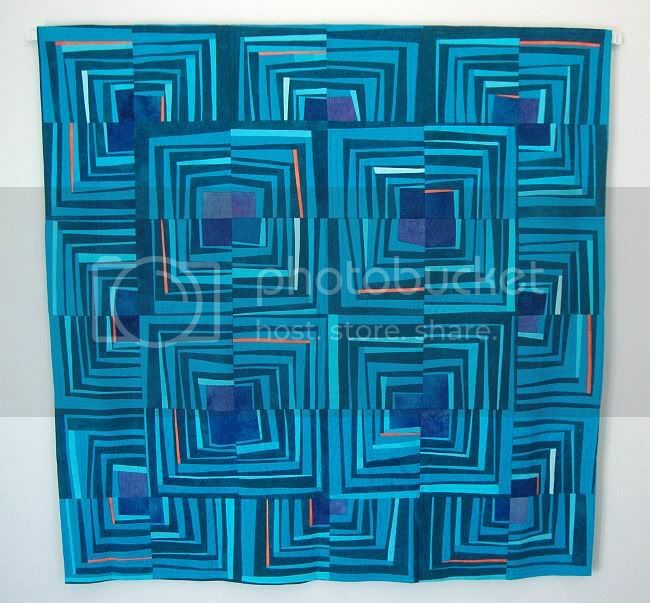 This blue and purple quilt has an abstract design, as quilts traditionally do, but creates a sense of depth by superimposing the four central squares partially over the eight outer squares. Layering is what Steven does with his pieces. 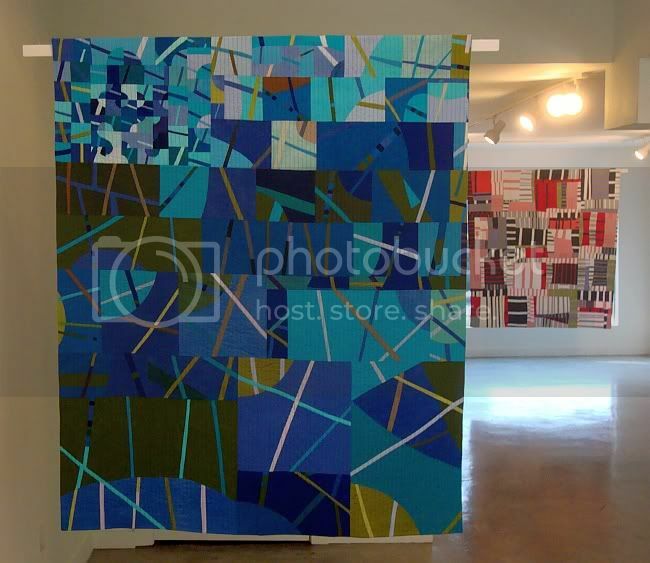 This act of layering and collage connects his work with his mother's quilting, as does his coloring. That's what was so unusual about this show--that the two artists would be so similar. I'm curious about the direction of the influence (if any). Hook adds an element--language. 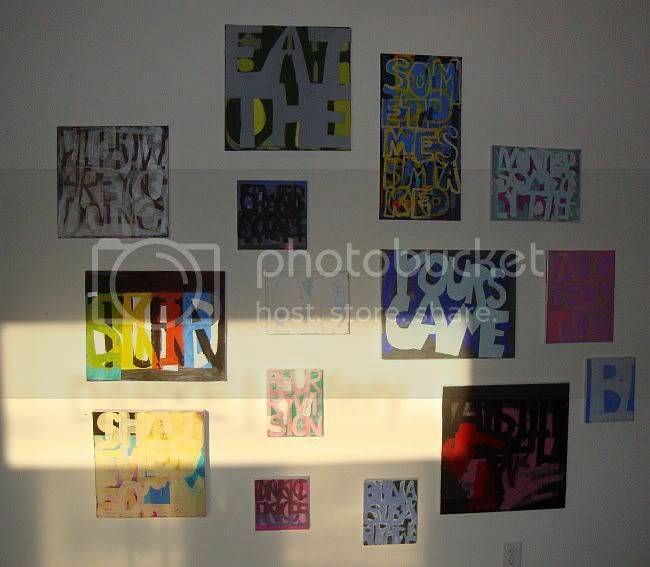 The phrases are suggestive without quite being meaningful (much less clever, like those in the work of Wayne White or Tara Conley). 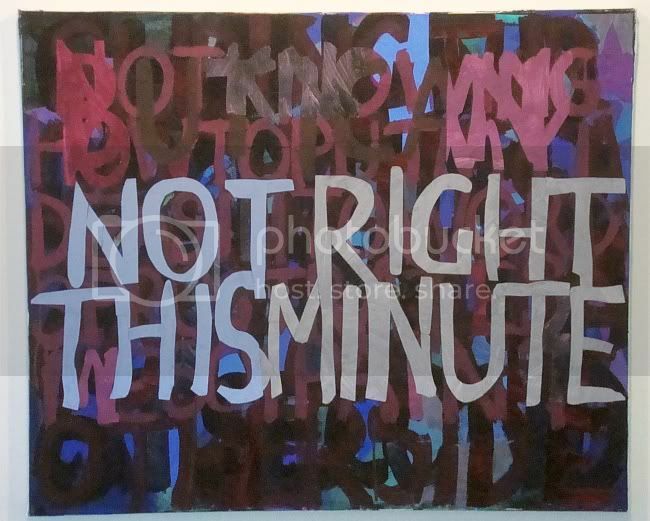 Just like a quilt, where a whole is created by reusing bits of the same piece of cloth, Stevens work builds up from repeating the word or phrase over and over. This could be read as an echo, or perhaps as the way a person who has suffered a head trauma will repeat a word or phrase when trying to communicate. Pairing Steven and Wendy Hook was an unusual move, but one that worked because their respective works share just enough to create an interesting dialogue.